THANK YOU TO ALL THOSE WHO HAVE CONTRIBUTED TO OUR JOURNEY TO BRING AFFORDABLE ELECTRIC MOBILITY TO RURAL WOMEN. WHILE WE HAVE REACHED OUR GOAL, WE STILL NEED INVESTMENT FOR THE PILOT TO DEMONSTRATE SOCIAL IMPACT & ECONOMIC VIABILITY, SO FEEL FREE TO GET IN TOUCH, OR MAKE A CONTRIBUTION HERE. WE WILL KEEP YOU POSTED AS WE MOVE FORWARD. THANKS AGAIN FOR THE SUPPORT AND FAITH IN THE PROJECT. For many rural women in sub Saharan Africa, days are busy. Not only do they do 60 percent of the agricultural work, but manage the household as well. Often the biggest use of their time is spent walking, getting from one place to another. It can be a long balancing act, carrying goods on their heads, to get to the market, to sell or bringing home the groceries. For example, according to UN Women, collectively, women from Sub-Saharan Africa spend about 40 billion hours a year fetching water. Mobility for Africa aims to provide robust, renewable energy charged electric tricycles, branded and backstopped by trained community support services, that can provide an avenue for communities to overcome these distances and contribute to dynamic local economies. Powered through community based off grid energy supply, e-tricycles could provide the incentive for increased economic activity, creating new local markets and enhancing rural livelihoods. A pilot targeting small scale farmers in rural Zimbabwe will determine questions related to usage, financial sustainability, technology, including renewable and GPS, and the social and economic impact on households. Mobility for Africa will establish a local manufacturing joint venture to expand distribution including to other countries in Southern and Eastern Africa. We need help to finance our pilot project we aim to start in January 2019. 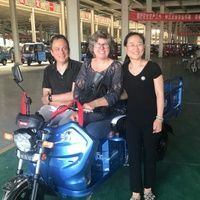 We would like to bring a container load of 60 electric tricycles from China to test within a community in Wedza, about 100 km from Harare in Zimbabwe. We have an M&E plan in place, along with students, who will help us with the research. But we need your help to raise $50,000 to pay for the bikes and the batteries to be delivered. We would love you to join us on this journey to bring the electric revolution going on in mobility to rural small scale farmers in Southern Africa. We believe that if we can test and build a viable model for rural women to benefit from this type of transport, we can help create new local economies and overcome huge development challenges, including children dropping out of school due to long distances and mothers dying before they get to the clinics. We will be sending out regular updates from the field and keep you posted on the outcome of the pilot. We believe once we can prove the model, and have proof of concept, we can then quickly scale up and expand to other areas. Mobility for Africa is a social enterprise that aims to bring renewable community based transport solutions to rural women in Africa that are affordable, efficient and environmentally friendly. * $27,200 in offline donations included in total.